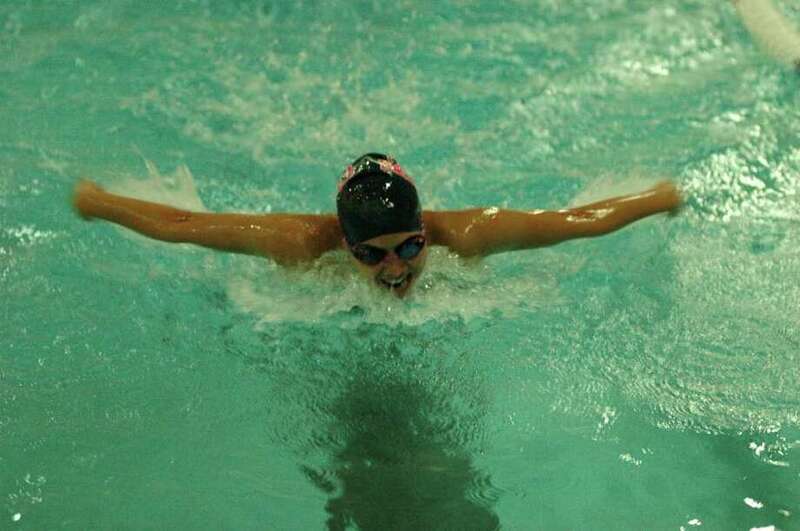 Caroline Valerio wins the 100-meter freestyle Friday in a 101-80 home victory over Ridgefield. After suffering a home loss to Norwalk two weeks ago, the Staples girls swimming team wanted to make a statement Friday. Staples bounced back Friday with a 101-80 home victory over Ridgefield (1-2) to raise its record to 2-1. Making the Lady Wreckers' victory even more special is that they did it without their best swimmer, sophomore Verity Abel, who missed the meet as well as the loss to Norwalk because she is sick. "We have a really good team and a lot of depth," Staples coach Mike Laux said. "We're just not as good as some of the best teams in the FCIAC. It was a good meet and I was happy to see six different girls win individual events, which was cool and it highlighted our depth." The Lady Wreckers also won all three relays and began the meet by finishing one-two in the 200-meter medley relay. Freshman Stacy Kaneko, sophomore Gabby LeBlanc, freshmen Jordan Santarella and Jessi Taets won the relay with a time of 2:15.50, and the relay team of Alexis Teixeira, Anita Vohra, Caroline Valerio and Rebecca Raab (2:16.19) took second, edging Ridgefield's top relay team (2:16.75). Sarah Cooperman won the 200-meter freestyle (2:20.23). "I was pretty excited going into the meet because we wanted to come out victorious," Cooperman said. "We have a really good support network, and I received a lot of support from my teammates." Gabby Wimer (2:22.26) grabbed second, and Emily Greene (2:31.63) took fourth in the 200-free. Although Staples didn't win the 200-meter individual medley, it outscored the Lady Tigers 9-7 in it. LeBlanc (2:44.16), Santarella (2:46.85) and Maragos (2:51.52) placed second, third and fourth, respectively, in the 200-IM. Taets won the 50-meter freestyle (31.24) and Raab (31.66) grabbed second. Michelle Mastrianni (150) won diving and led a sweep in it. Freshman Olivia Crosby (137) took second and sophomore newcomer Anna Violette (135) was third. "It was a good meet," Mastrianni said. "I didn't expect us to go one-two-three and I'm glad we did. The new girls improved a lot and it's a testament to what we accomplished in a short amount of time. I'm very happy with how the divers did." Valerio triumphed in the 100-meter butterfly (1:12.26). "I worked on my stroke the day before in practice," Valerio said. "I saw I was close midway, and I wanted it up and beat her." Wimer won the 100-meter freestyle (1:04.40). "It was [a matter of] making sure I picked it up and went faster in the second 50," Wimer said. "I made sure I brought my kick into it." Kaneko (1:06.15) took second in the 100-free. Staples didn't win the 400-meter freestyle but ended the event with an 8-8 tie to Ridgefield, courtesy of its depth. Cooperman (4:51.64) and Santarella (5:08.95) took second and third, respectively, and Greene (5:29.16) was fifth. Wimer, Raab, Taets and Cooperman won the 200-meter freestyle relay (2:03.38). Kaneko grabbed first in the 100-meter backstroke (1:14.75). Valerio (1:17.55) and Teixeira (1:18.29) were three-four in the 100-back. Ridgefield won the 100-meter breaststroke and if the Lady Wreckers would have won the event 9-7 if they didn't swim it unofficially. LeBlanc (1:23.81), Vohra (1:26) and Maragos (1:29.38) had the second, third and fourth best times in the 100-breaststroke. Wimer, Santarella, Cooperman and Kaneko comprised of the fastest 400-meter freestyle relay team (4:29.77). "It's pretty exciting beating Ridgefield because they are a middle of the pack team and it's a good win for us," Valerio said. "We showed we have a good core and will take a lot from it as a team." Wimer said, "We had awesome races and we want to be in the top half of FCIACs. We need to beat Ridgefield in order to accomplish this." Getting the win without Abel lifts the team's spirits. Staples would have had a better chance of defeating Norwalk if Abel was in the lineup. "I think it's great beating Ridgefield without Verity and it boosts our confidence," Mastrianni said. Cooperman said, "It's a little daunting losing a key member of the team but it also motivates us because we want to pick up the slack from not having one of our best swimmers in the lineup. We look forward to having Verity back."